In just a few short days, excitement throughout the Americas will once again rise with the beginning of the Parapan Am Games. We will surely be in for more athletic treats of the highest order! To help speed the wait, I thought it would be nice to reflect on some of the best moments of the Pan Am Games. Below you’ll find my top picks — but I’d love to see yours! Which events were you able to witness firsthand? What moment shocked or surprised you? How did you feel about the final medal count? Let’s chat! Comment below, on Facebook or by tweeting me at @yorkustudents. On July 21, I had the ultimate pleasure of attending my first Pan Am event in person. My friend Sola came along, and together we watched some morning medal events at the CIBC Pan Am/Parapan Am Stadium on campus (YOR). Not only was the weather beautiful that day (not too hot, with a brilliantly blue sky and the perfect light breeze) but we also experienced some really exciting events, including the women’s 5000m, the men’s and women’s 100m heats, women’s javelin throw, men’s pole vault and men’s long jump. I witnessed Canada’s Elizabeth Gleadle take the gold for javelin up close. By far my favourite event to watch, however, was men’s pole vault — the fierce athleticism of the competitors was astounding. Ten vaulters quickly whittled down to first seven and then fewer and fewer as competitor after competitor failed to vault the increasing height. Eventually only Team Argentina’s Germán Chiaraviglio and Team Canada’s Shawnacy “The Barbs” Barber remained. Here’s a quick video of Shawn vaulting 5.60 metres. To no one’s surprise, he later won gold with a vault of 5.80 metres, a feat that had the crowd going wild! The same day I was at the CIBC Pan Am/Parapan Am Stadium, so was Andre De Grasse. I watched as he seemingly without effort led the men’s 100m heats. Which was why I wasn’t surprised when I later learned that he had won gold in not just the men’s 100m but also in the men’s 200m. He even set a Canadian record in the 200m, with a time of 19.88 — the first under-20-second score for a Canadian. Talk about impressive! 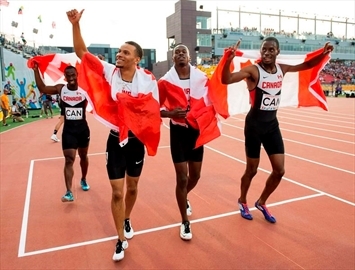 A short-lived celebration for Team Canada after winning the men’s 4x100m relay. Image source. The most shocking moment came with De Grasse’s final event — the men’s 4x100m relay. The team coincidentally included the recent York graduate Dontae Richards-Kwok. In the semi-finals, Team Canada had come in third, setting a season best of 38.39 seconds, guaranteeing the team a place in the medal round. In the finals, they seemed determined to give their strongest effort, and that they did, finishing first with a Games-record time of just 38.06. Moments later, however, that victory came under scrutiny, and two agonizing hours later, Team Canada was officially disqualified from the event due to a misstep by Gavin Smellie; his foot had touched the lane line. Darn, they were so close! One of the most inspirational moments of the Games came to us through another young Canadian, Emily Overholt. The 17-year-old swimmer had been set to win gold in the 400m individual medley event, but an illegal turn disqualified her. Instead of giving in to her certain disappointment, she focused harder, and a day later, in the 400m freestyle competition, she set a new Pan Am record of 4:08.42, taking the gold for good. She also took home a silver medal in the women’s 200m freestyle, and a bronze in the women’s 4x200m freestyle relay. Is that an attitude and fighting spirit we can learn from or what? She can’t contain her excitement after winning gold just a day after being disqualified: Emily Overholt. Image source. Team Canada’s Damian Warner broke not only the Games record but also a long-held national record (from 1996) when he competed in the decathlon, a ten-event affair. He started off strong with the best heat in the 100m sprint, which he completed in just 10.28 seconds, also setting his own best time. From there he literally soared 7.68 metres in long jump, for the second time beating out all his competitors. Next up was shot put. His throw wasn’t the best, but it was still strong at 14.36 metres. From there he headed to high jump, leaping 1.97 metres. To finish off the day, he won the 400m heat with a 47.66 time. His Day 1 score was a whopping 4460. Team Brazil, in second place, scored 4397. Damian Warner standing in the Superman pose, which in his case seemed appropriate! Image source. Day 2 started off with the 110-metre hurdle race. Again, Damian achieved best time in just 13.44 seconds. Then came time for discus, in which he came third with a 47.56 metre throw. Damian cleared a 4.90 metre bar in the pole vault that followed. At this point, his closest competitor was unable to vault successfully, dropping out of the decathlon. Damian went on to compete in the javelin toss, hitting a length of 61.53 metres. The 1500m run marked the final event of the day. To break the existing record, Damian had to finish in 4:29.5 or faster. He completed the run in just 4:24.73, earning him a record-breaking 8659 points. By comparison, the last Pan Am record was set in the 2011 Guadalajara Games, at just 8373 points. The most recent Canadian (set by Mike Smith in 1996) record came closer, at 8626 points. This information just leaves me all the more astounded at Warner’s capabilities!